An ancient fort located on a hilltop, Maiden Castle in Dorchester, England is Britain’s grandest and most advanced hillfort dating from the Iron Age. Constructed for protective purposes primarily in the 1st century BC, this giant creation is described as having the expanse of around 50 football fields. With its size and complexity, Maiden Castle is a testament to the multiple uses of the ancient site that showcases both spectacular feats of design and construction while commemorating those forgotten at an Iron Age cemetery with admittedly grisly remains preserved at the site. The awful injuries present on remains shows the violent nature of ancient conflicts — as brutal as conflicts get in modern times. Remarkable ancient religious relics arising from conquest and associated construction works are reflected in the historic site’s amazingly diverse archeological finds. A 4th century AD Roman temple stands out as a distinctive find, while the remnants of a Neolithic enclosure date to an ancient 3500 BC. The gigantic hillfort would have stood out prominently on the landscape in its prime thanks to its massive white chalk ramparts, which cumulatively formed a huge protective settlement that would have contained hundreds of inhabitants. These huge ramparts date from the 1st century BC. A site that is both ancient and enticing, England’s bizarre Rollright Stones form an ancient monument consisting of three distinct elements that are named evocatively as The King’s Men stone circle, the King Stone, and the Whispering Knights. The monument site is placed on lands at the border of Oxfordshire and Warwickshire. The Whispering Knights is a burial chamber dating to the earlier parts of the Neolithic era, around 3800 to 3500 BC, while the King Stone is a single standing relic of the later Neolithic era from about 2500 BC. The King’s Men stone circle is a most dramatic site, but is notably newer than the other stone features that make up the Rollright Stones site, dating to either the early or middle portions of the Bronze Age at approximately 1500 BC. The monuments are formed from the oolitic limestone sedimentary rock that dates all the way back to the Jurassic geological age. This stone was taken from the Cotswald Hills, which are formed of this rock and rise in close proximity to the Rollright Stones site. Protective installations around the King Stone and Whispering Knights protect the heavy monuments. The King’s Men Stone Circle, which may recall a very rocky crop circle, can be easily approached on foot. Stonehenge, Avebury Henge, and Woodhenge stand out as the mysterious remains of prominent ceremonial sites holding great importance in Neolithic Britain. Forming part of a designated World Heritage site known as “Stonehenge, Avebury & Associated Sites” that includes the iconic Stonehenge, the lesser known Avebury Henge, and the Stone Circles, the henges are diverse and spaced well apart, some as far as 30 miles from each other. World famous Stonehenge has the most massive and impressive stone elements by far, while Avebury Henge is comprised of much smaller stones. However, the Avebury Henge has a much larger diameter than Stonehenge despite the smaller size of the stones making up the relic. In fact, Avebury Henge is the greatest megalithic structure on Earth, with a record-setting size of a 380-yard diameter and a circumference of 1,090 yards. Earthworks and ditches onsite add to the intricacy of the structure. The site features have been restored to showcase their remarkable structural form consisting of earth mounds, delineations, enormous stone boundaries and circles of ancient ceremonial significance. One of the most fascinating facts about Stonehenge is the discovery of the material’s origin in Wales rather than England. Nothing short of exceptional was the effort required to move the stones. Another exceptional ancient monument near Stonehenge is “Woodhenge,” which contained an incredible number of ancient wooden posts in a circular area. Concrete pillars mark the exact sites of the decayed wood posts. One of the largest man-made ancient monuments in the world is a chalk pile of anthropological origin in Wiltshire. While the brown, sandy colored pyramids of Egypt are most familiar in the world of archaeology, a site in England offers great contrast. The lesser known Silbury Hill is green in color, pyramid-like, yet rounded around the edges as it forms a dramatic cone, looking like a grass-covered mini-volcano or a pyramid that has been rounded off and then covered with a protective coating of turf. Silbury Hill is a unique feature falling within the Stonehenge, Avebury & Associated Sites World Heritage site. Rising approximately 98 feet above ground level into the sky with a width of around 534.95 feet, the immense anthropological formation is Europe’s highest human created prehistoric mound with a size coming close to the small pyramids of Egypt. Tunneling expeditions into the mysterious Silbury Hill have been made in the past three centuries a total of three times, first in 1776 in hopes of figuring out the nature of the hill. Yet, despite investigations, little was found, except for the discovery of three separate stages of building. Ominous collapses put a crater in the top of the hill, limiting the degree of further digging. The true purpose of the hill and its potential contents remain a mystery. The notorious and much discussed final Plantagenet English King Richard III’s Grave was discovered in August 2012 at the unlikely location of what is now the site of Leicester’s Greyfriars Friary Church. Looking for Richard was a project with which the University of Leicester’s archeological workers assisted, culminating in the discovery of what was proven to be Richard III’s skeleton. The burial of the late king’s body presents a rather mysterious state of affairs, beginning with the fact that the grave was shallow, and at the same time, so cramped that the head of the king was tilted to allow the cramped space to accommodate the remains. Furthermore, the grave is not properly dug with square edges, but rounded at the bottom, indicating shoddy removal of material. Remarkably, nearby building works and a separate incident of stone removal close to the burial site did not end up destroying the precariously laid remains. The skeleton had remained essentially intact, but rather eerily, the feet were missing, although the state of the remains indicate that the feet would have been present at the time of the original quick burial. This is fortunate given the riches of archeological value presented by the find of Richard III’s body. Now, the gravesite is remarkably preserved with a glass casing and viewing center known as the King Richard III Visitor Centre. Buried treasure might be the fuel of pirate legends galore, but ancient archaeological finds known as hoards have been a prominent placeholder in England’s archaeological history. 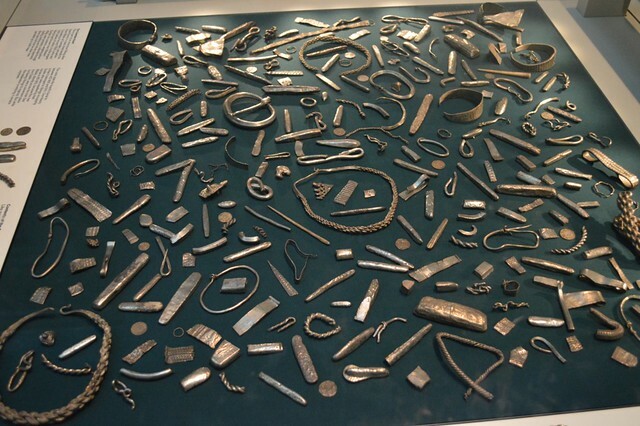 The grandest and most spectacular find of its type in England ever is the top Viking hoard on the British Isles, known as the Cuerdale Hoard. The extraordinary and lucky find was made on May 15, 1840 by workers engaged in repairing the embankment along the River Ribble at Cuerdale, close to Preston, in the vicinity of Lancashire. Over 8,600 objects, including many diverse precious metal artifacts were in the hoard, placed by the Vikings in the site near Lancashire. The way that the hoard was discovered consisted of some interesting packaging. The immense array of real-life buried treasure was found not in a wooden chest but in one that might come into question for material safety. The artifacts were packed in a massive chest of lead. The landowner’s bailiff secured the treasure, which was then earmarked as the property of Queen Victoria in right of her Duchy of Lancaster before being entrusted to the ownership of the British Museum, who received the majority of the find. The laborers who made the discover were not forgotten altogether, as they got to receive one coin per member of the crew. How generous. Given that England is on an island, historical finds relating to historic migration is of great interest in studying the archaeological and anthropological history of the country. A site of enormous historical significance, Sutton Hoo — a sandy burial site and treasure cache near Suffolk on the English coast — is the finding place of the famous Sutton Hoo Helmet. Two cemeteries from the 6th and 7th centuries are present, with a huge array of finds pertinent to understanding Anglo-Saxon settlement history. A most incredible find, of significance in England and worldwide, was the discovery of an entire ship burial site, with concrete evidence offering great insight into Anglo-Saxon history and helping to increase knowledge of this foundational but insufficiently understood time in history. The ship burial was at first thought to be of Viking origin but was later determined to be part of an Anglo-Saxon relic site of great archaeological significance. Shedding great light on the history of settlement in England, the finds include hundreds of artifacts with gruesome depictions among them. One plaque shows a horse trampling an enemy soldier to death, while the remains of a man onsite were found to consist of a warrior buried beside his horse, weapons included. The Great Wall of China may be exceptionally famous as a global landmark, but lesser known is a monumental ancient wall constructed by the Romans crossing what is now a landscape of northern England. The laboriously built Hadrian’s Wall is a lengthy structure stretching 70 miles across northern England, which was constructed in the 2nd century AD with the intention of clearly marking the boundaries of the northern reaches of the mighty Roman Empire. In modern times, clear remains of the wall that was built to proudly stand in a span extending from the River Tyne, in the vicinity of Newcastle and close to the North Sea on England’s east coast all the way to the Irish Sea off England’s west coast. A frequently retained mistaken view of Hadrian’s Wall is that the formation was established as a border between England and Scotland. In fact, the structure lies entirely within England, with the land North of the wall a continuation of English land prior to the border with Scotland. The wall was made from stone segments with a variety of forts installed as lookouts and defense sites. Furthermore, a ditch was created to curb incursions by advancing troops intent on crossing over the wall. 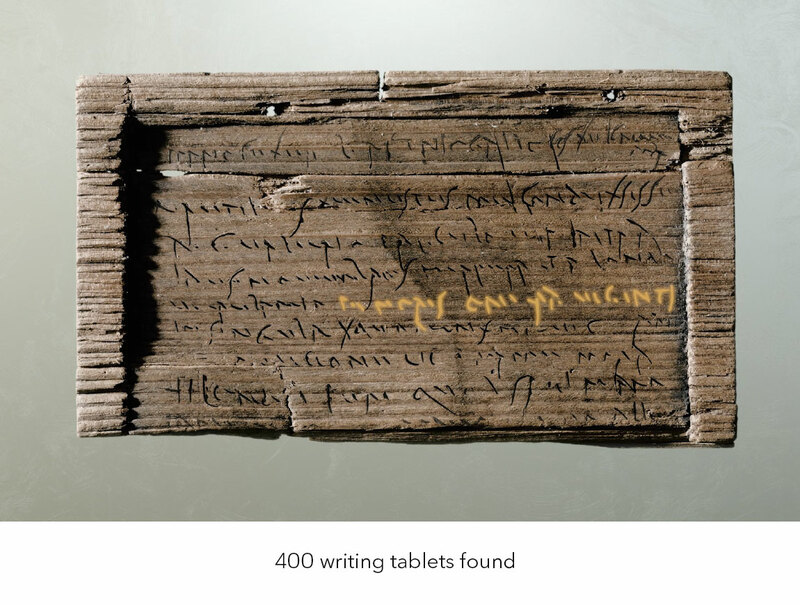 Discovered during the construction of a building in London to serve as the new Bloomberg LP headquarters for Europe, the 405 pieces of inscribed wood created by Romans that soon became known as the Bloomberg Tablets were unearthed. At the Queen Victoria Street construction site, the waxed wood pieces had been written upon with blackened wax using a stylus as a writing instrument. Some of the pressure-created markings survived on the wood into the time of their modern discovery despite the breakdown of the wax itself, allowing archaeologists to make out a multitude of fascinating ancient Roman messages in great detail, often in their entirety. The messages that were transferred into the wood material underlying the writing wax were greatly aided in their preservation by chance hydrogeological conditions onsite. The tablets were found in an area that was deluged by mud-bearing floods from the Walbrook River, a once open watercourse that is now buried. The highly waterlogged, muddy conditions in which the tablets were enclosed over time may have been dirty, but it was also an oxygen-deprived environment. This deterred decay significantly, providing a remarkable literary window into time. Notes speak of London referred to by the name “Londinium,” and included a vast range of messages including contracts for materials delivery. Stonehenge, an iconic stone Neolithic monument of international renown, is so famous that it was not given an introductory account on this list. But lesser known is the existence of another very strange “henge” in England. It might seem that “henges” are becoming a theme in England, and the discovery of well preserved timber built “Seahenge” in Norfolk stands as testament to the boundless innovation and diversity of construction site location displayed in the creation of ancient monuments. Seahenge is a remarkable site of ancient religious significance that was constructed in the water, originally rising above the surface in the shallows in the Norfolk region of coastal England. The site appears to have been originally constructed from material that was cut down in two different years, with a central stump from one tree, while the exterior ring of posts forming the bulk of the henge are believed to have originated from trees felled the year afterwards. The salvaged remains of the oak wood that forms the decaying timbers dates to 4050 BC. In an effort that attracted some controversy, the timbers of the henge were removed and studied, with a plan in place to return the timbers following completion of studies.